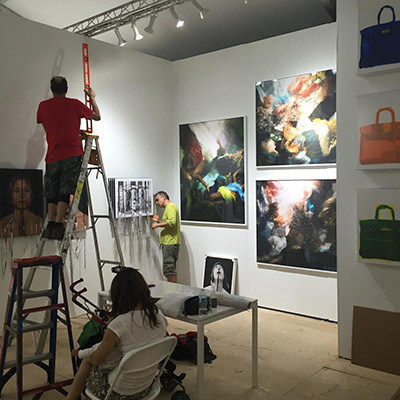 Let There Be Art Gallery, Mexico City presents Rogers works this year at the amazing Scope Miami Art Fair from December 1 - 6, 2015. Ten Arts presents Rogers works at this years Fotofever fair in the magical Carrousel Du Louvre, Paris, France from November 13-15, 2015. Rogers has added 89 individual diamonds to two particular prints to represent shinny night stars, (55) 1.5mm and (34) 2.0 mm stones, hand set into her mounted museum quality papers. The numbers (89, 55, 34) are numbers in the Fibonacci Sequence, natures' numbering system. These numbers appear everywhere in nature, from leaf arrangements in plants, to grains of wheat, and are applicable to the growth of every living thing, from a single cell, to mankind and the universe at large. 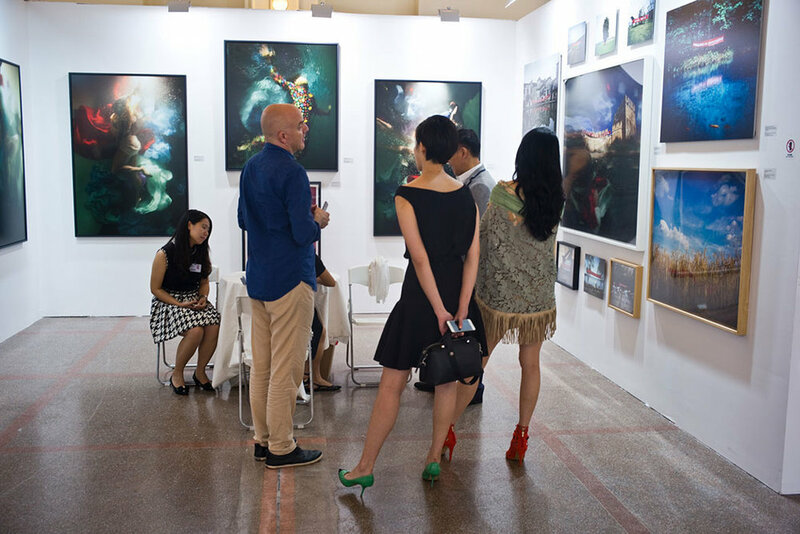 Art Labor Gallery presents Rogers work at Photo Shanghai this year, held at the fancy Shanghai Exhibition Centre. Sept 13 - 15, 2015. The opening night at Let There Be art Gallery was a blast and we’re so grateful to the warm hearted people of Mexico City for their hospitality and kindness. Celestial Bodies will be on view from August 6th to October 1st, 2015. Please come by and say hello to the wonderful staff of Let There be Art Gallery in the beautiful Polanco neighborhood. LTB Art Gallery is pleased to announce part one of Christy Lee Rogers’ most extensive and ambitious exhibition to date, Celestial Bodies. The collection features new large-scale color photographs, star and cloud time-lapse, water and interpretations of space video installations and wood relief sculptures. Her new work explores the human condition and spirit through the gravitationally bound structures of the universe, expanding on and transporting her already imposing vision, literally into the stratosphere. A portion of the photography collection is dedicated to Rogers’ interpretation of the dualistic nature of the universe. She explores the idea of the two opposing, yet complementary forces into which creative energy divides and whose fusion brings the phenomenal world into being, with double images that transport one in time and space into her classical yet futuristic world. Christy Lee Rogers' Celestial Bodies will run at LTB Art from August 6 to September 6, 2015, with an opening reception on Thursday, August 6 from 6 to 9 pm. It was such a pleasure and honor to meet this amazing class of students at The Art Institute of Tennessee, Nashville. Thank you to their professor Jennifer, and wishing each of them a spectacular career in art. We are pleased to announce that Roger’s work will now be represented by Art Labor Gallery in Shanghai, China. 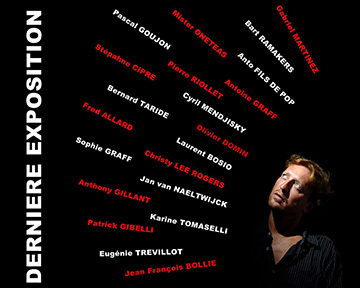 A solo exhibit will take place in July and through August, 2015. Dates to be released shortly. Thank you Lycée DUPLESSIS-MORNAY Art School in Saumur, France for such a wonderful Skype conference!! I enjoyed meeting you all.... and thank you Eliane of Ten Arts Paris for the amazing exhibition at Galerie d'Art du Lycée. It’s an honor to award Alicia Jones, from Aptos Middle School, a left handed acoustic/ electric guitar. She currently plays the violin and loves all string instruments. 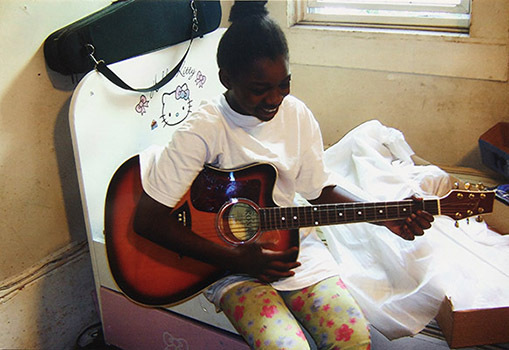 Alicia writes “Thank you for thinking about me and receiving a guitar. The reason I would like to receive this gift is so that I can continue to pursue my interest in all the types of string instruments. I presently play the violin which I learn how to play at school, and also private lessons by my neighbor. If I receive this this gift it will be used wisely and responsibly."